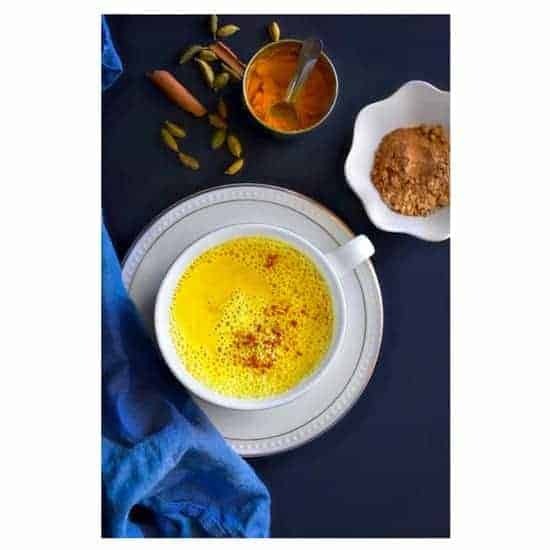 Healing Cashew Golden Milk is a powerful natural healer that energizes the body, calms digestive system and immensely effective to cure cold-cough/body ache. 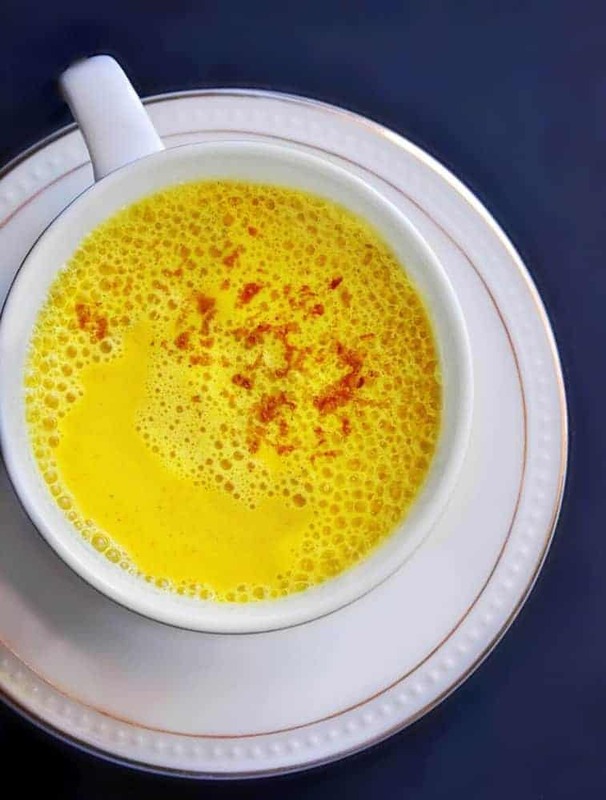 Also known as Haldi Doodh in India or popularly known as #GoldenMilk / #TurmericMilk and is one of the most famous drinks of Ayurveda. 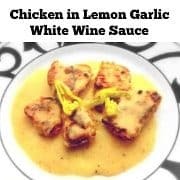 I’ve been wanting to post this recipe for the longest time and it kept pushing back because of something or the other but that’s it – I HAD to share it TODAY. 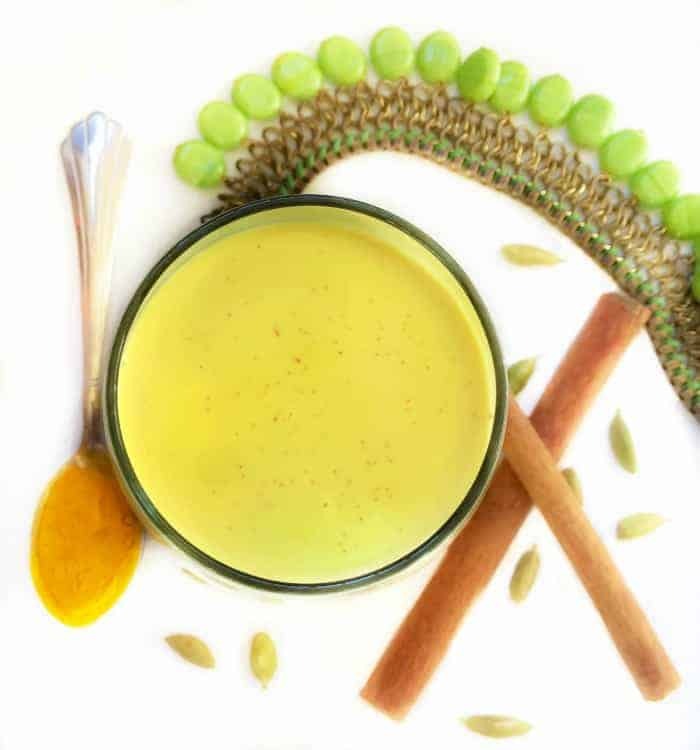 Many of my friends have requested this one special as the Healing Cashew Golden Milk is the most effective and quick remedy for the seasonal or long-term Cold n Cough. It especially comes in handy, when you have coughed so much that even a thought of coughing again gives you chills as every bone and your throat hurts. 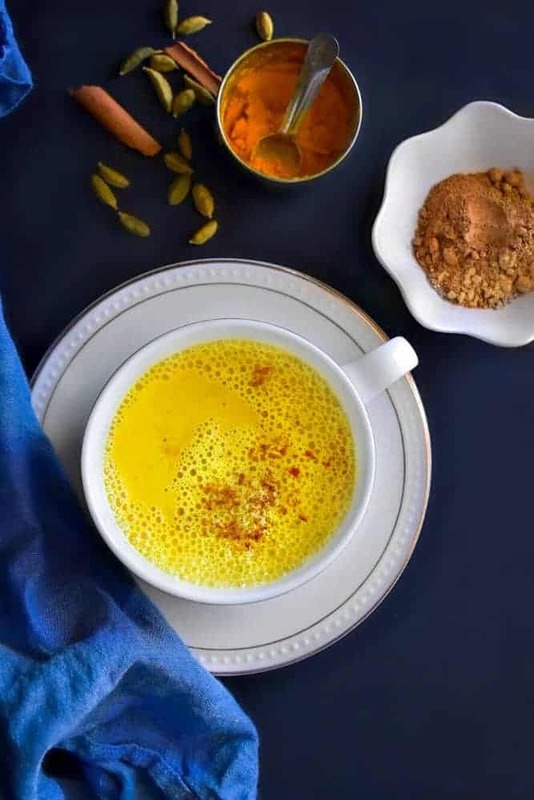 I remember my Mom, making this Turmeric Cashew Milk for all of us especially during winter as a preventive drink (from cold). And this is truly her recipe and I feel thrilled about sharing it with you’ll. In those days, she literally used to make cashew milk at home and then she would mix in the other ingredients and cook everything for a good 1-2 hrs. 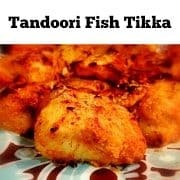 is considered the most powerful spice in Indian spices and it’s not just because of it’s taste/golden color but because of its medicinal property. It’s Anti-inflammatory (It helps the body fight foreign invaders and also has a role in repairing damage). It helps boost the body’s own antioxidant enzymes (to fight infections) and brain function hence help in preventing many common to serious ailments. It also helps prevent seasonal depression….I mean I can go on as the list of benefits are almost endless. It’s also one of the most potent ingredients in many Ayurvedic medicines/solutions. 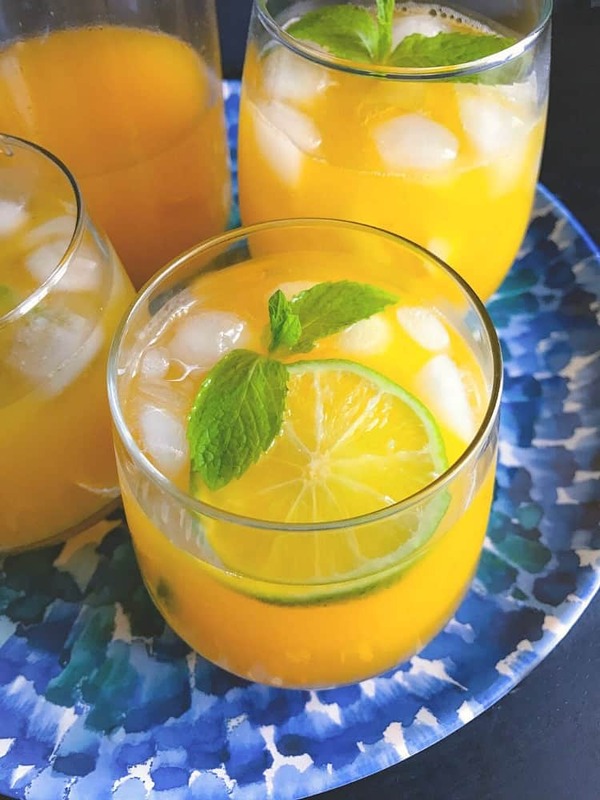 ‘Turmeric has a peppery, warm and bitter flavor hence if you use too much, the recipe would end up tasting bitter and you would feel very hot as well. The KEY is moderation. 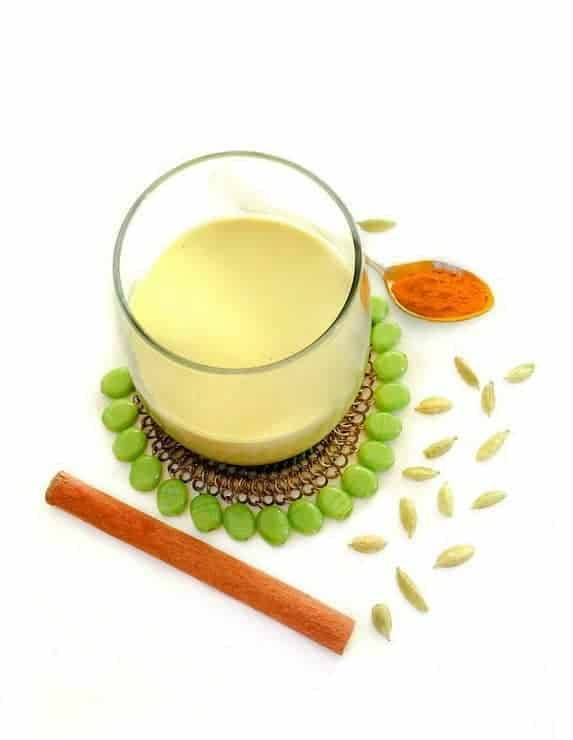 Similarly, Cinnamon and Ginger also have ‘anti-inflammatory’ and healing property hence this milk mixture is almost like liquid gold and is famously known as Golden Milk. Now, in this mixture of spice blend, I’ve also included Cardamom which not only enhances the taste (yummmmm). I’m using Cashew Milk (store bought) but you can use any kind of plain milk/ almond/coconut, almost any kind except chocolate or fruit flavored milk. The process is pretty simple and takes about 10-15 minutes (depending on your choice). You just put everything together in one pot and steep the spices in low heat till the mixture thickens. Then strain the milk into a jar or air-tight glass bottle and you can store this upto 1-2 days (I prefer making a fresh batch everytime). You can add your choice of sweetener or can even add honey (because of its healing properties) …some people even add jaggery to it. 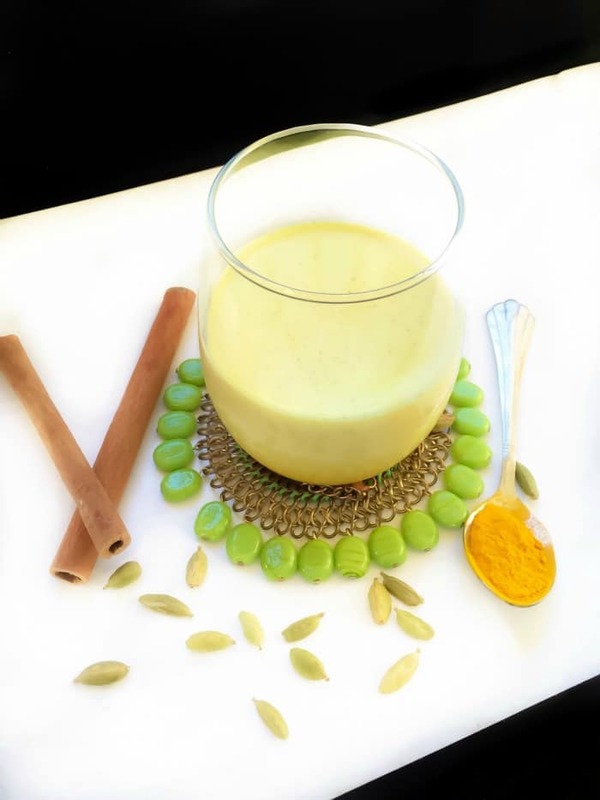 Healing Cashew Golden Milk is a popular Ayurvedic drink from India and filled with powerful healing and delicious flavors. 2 Cups Cashew Milk - you can use any non-flavor milk. 1/4 Cup Water - if you like a thick consistency, you may avoid water. 3-4 Whole Green Cardamom - crushed. In a medium pan, add water, milk and place on high heat. Add all the spices and let boil the milk. After the first boil (in about a minute), reduce the heat to low and let this simmer for 8-10 minutes (keep stirring every 2-3 minutes, to prevent milk from burning). Once the milk is boiled and thickened, turn off the heat. Add the sugar/sweetener (whatever you prefer) and stir. 26 Replies to "Healing Cashew Golden Milk - #turmericmilk"
Thanks Agnes, I’m so glad you like it. It’s really simple n yummmmm! 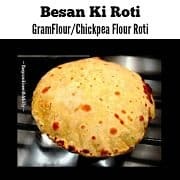 If using powdered cardamom for cashew turmeric warm milk, how much do I use for the 2 serving recipe? Also, if using whole green pod, do you crush to remove seeds and then crush the seeds to add only seed powder to milk? Can you eat the pod or seed or do you strain them? Thank you much! Cardamom Powder: you can use 2-3 Pinch. It is used to flavor and give a sweet scent to the dish. If you like a strong cardamom taste, you can add more. Whole Green Cardamom: you can crush to remove pods, then further crush the pods to a fine powder and add accordingly. Some people like the taste of whole pods/slightly crushed pods too. My husband and I were just watching a video about the benefits of turmeric. I’m coming down with a little cold so I definitely need to try this. 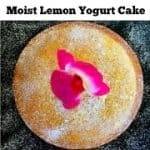 I’ve never had that, but it sounds delish! I also love how stylized your photos are. Oooooo I will have to give this a try!!! I have been turmeric obsessed for a bout two years now! Great stuff! 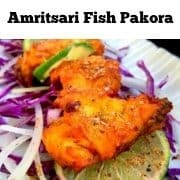 That would be Awesome – Do give it a try soon 🙂 Thanks for visiting. I’ve never tried tumeric before (at least not that I know) but your timing is perfect. Everyone in my office seems to be coming down with a cold and I’m refusing to get sick right before I go away on my winter holiday! I’m going to give this a shot as a preventative measure. This sounds too good to be true! I’ll have to give it a try! 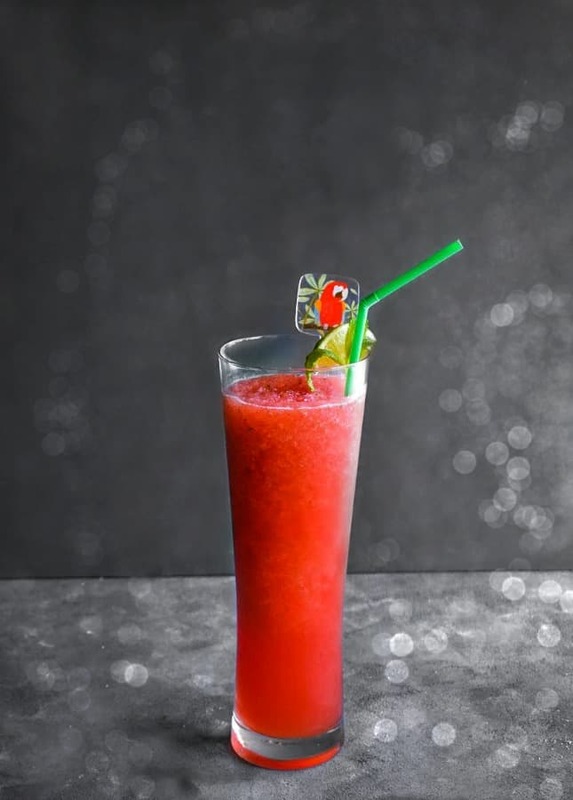 This looks great to sip on while it’s so cold out lately! I love the pretty color too. that’s something different than the hot lemon tea my Mother used to make 🙂 I’m curious at the taste of this! This looks delicious and healthy. I know turmeric is really good for you. I’ll have to try this one! Nice photos too. Thanks for sharing this! 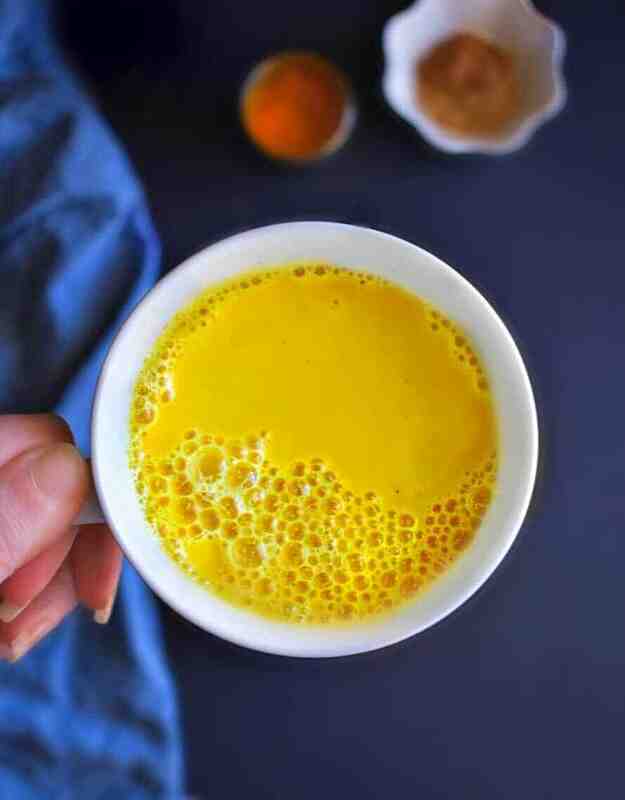 Tumeric seems to be everywhere these days and I love that you added it to milk, what a great idea to try soon! I need to try this! Looks amazing!